Mitt Romney, left, on the field before a game between the New York Jets and Miami Dolphins on Dec. 1 in East Rutherford, New Jersey. He’s baaaaaaack! Well, maybe. Erstwhile Republican presidential nominee Mitt Romney told a group of donors that he’s considering another run for president. There are plenty of reasons to think Romney won’t pull the trigger and plenty more to think he’d lose if he did. But just what the heck is tempting Romney into the 2016 race? 1. The Republican field is divided. In March, I wrote that this was the most split Republican presidential field in the modern era (since 1976). And that still holds today. Jeb Bush’s 23 percent support in a recent CNN survey was the highest for any non-Romney candidate over the past year. Most polls show every candidate (besides Romney) south of 20 percent. 2. Romney does well across the party. In a recent Monmouth University survey, Romney had a +28 percentage point net favorable rating (favorable – unfavorable) with non-tea partyers, and a +19 percentage point net favorable rating with tea partiers. That 9 percentage-point gap between the two groups was the smallest for any candidate. The average difference was 24 percentage points. In other words, Romney has reason to think that he can unite the different portions of the party in a way that others cannot. 3. Romney leads in the early states. If any candidate wins the Iowa caucus and New Hampshire primary, it’s likely that he or she will win the nomination. Romney averaged 23 percent in the three Iowa caucus polls taken over past six months. That’s right near the 25 percent he won in the 2012 caucus. He averaged 30 percent in two New Hampshire primary polls taken over the same period. No one was close to him in either state’s average. Some of Romney’s lead is, no doubt, because of name recognition. Still, he scored a 65 percent favorable rating and a 77 percent favorable rating in the most recent surveys taken among Iowa and New Hampshire Republicans, respectively. No one else comes close to that in New Hampshire, and only Romney’s 2012 running mate Paul Ryan (who has said he won’t run if Romney does) beats him in Iowa. 4. Romney has reason to think he can raise money. To maintain his early lead, Romney is going to need lots of money. He’s likely to have it. There’s a reason Romney announced that he’s considering running in a room full of donors. As the former nominee, Romney has a wide fundraising network. Anyone else remember when the Romney-aligned Super PAC, Restore Our Future, blasted his fellow Republican candidates during the 2012 primary season? 5. Romney has reason to think he can win the general election. The national polls are mixed for Romney. Many show him well behind Hillary Clinton, while some show him to close or slightly ahead. Romney is in dead heats with Clinton in Iowa and New Hampshire. Moreover, President Obama remains unpopular. While his approval ratings have inched up, Obama is still, at best, at 45 percent. That’s not a death knell for Clinton, but it does give the 2016 GOP nominee a real shot at winning. Given the growth in the economy and Obama’s approval rating, Romney would be expected to be a slight favorite over Clinton. These “fundamental models” paint a much better picture for the eventual Republican candidate in 2016 than they did in 2012. Note, however, these are reasons Romney is considering running. Who knows if he actually will? 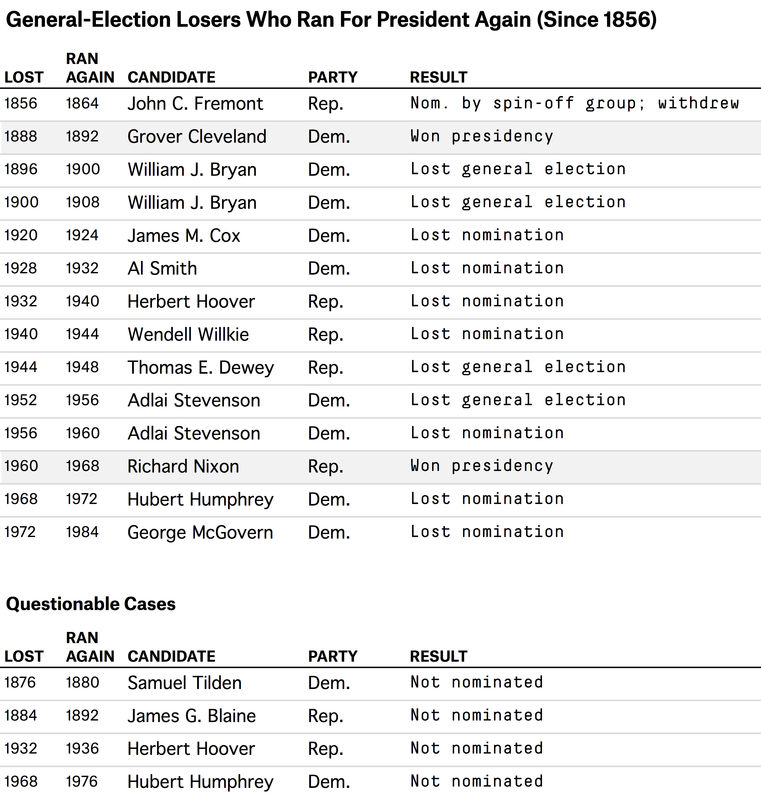 General election losers that have run for their party’s nomination again have a terrible record. Besides the grueling campaign, it’s far from a guarantee that Romney would win the general election or even primary. The economy is getting better, which will make any run against Clinton more difficult. Much of Romney’s support among Republicans may go adios once Republican voters see the other candidates and are reminded of Romney’s flaws. Romney will have to weigh all of these factors before deciding whether to run.